More than forty years ago, a simple lamppost was built on the grassy median of the principal roadway leading into Prospect Park. This lamppost and its concrete base serve as a 'mirador.' This is the story of the Brooklyn Mirador. The 3-point alignment which provides the view of the Empire State Building framed within and bisecting Brooklyn’s Civil War Memorial Arch at a 90-degree angle along the axis of Grand Army Plaza is based on the framework designed by Calvert Vaux and Frederick Law Olmstead. Vaux and Olmsted designed Prospect Park Plaza before the Civil War ended, aligning the elliptical plaza’s axis with the site of the future Tower, then owned by William B. Astor, a leading anti-Lincoln Democrat who advocated Constitutional protection of slavery. 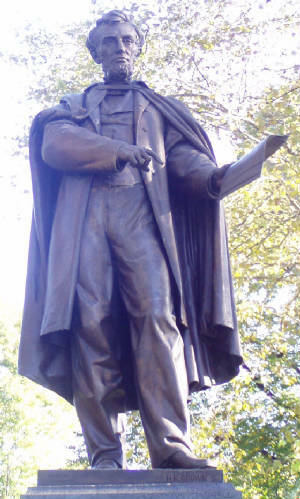 In June 1895 (one year before the Supreme Court ruled that states had the Constitutional right to require racial segregation) the Lincoln statue was removed from his plaza and positioned in Prospect Park’s Concert Grove. Aligned with the skylight of the 1874 Oriental Pavilion, it now faced Gravesend Bay where, in November, the embattled 70-year old, 4’10” Calvert Vaux would be found drowned. In December, equestrian statues of Grant and Lincoln were quietly installed on the Archway walls, facing North, with no public ceremony. In 1898, the Quadriga, “Triumphal Progress of Columbia,” was unveiled atop the Civil War Arch – facing South, confronting the the Prospect Park masterpiece. The Waldorf-Astoria had replaced the Astor mansions and now served as the center of society. Brooklyn was consolidated into New York City. In 1929, the Waldorf was demolished, making way for the Empire State Building which opened in 1931. Former head of DuPont and General Motors, John Jakob Raskob, stood a pencil on its end to show his architect the building he wanted. The alignment was now visible from the middle of the busy Prospect Park entrance roadway. Bailey Fountain, unveiled in 1932, faced the Tower. In 1965, two years after his assassination, a memorial to John F Kennedy was unveiled in Grand Army Plaza, facing North, near the spot where the Lincoln statue stood. In 1969, a year after Robert Kennedy and Martin Luther King Jr were assassinated, the median on the entrance roadway was planned. A median lamppost marks the perfect vantage point, the precise spot to stand to see the unobstructed view of the tip of the tower of the Empire State Building bisecting the 1892 Arch, appearing to touch its keystone. Similar alignments are not historically unusual. In 1806, Napoleon planned two triumphal arches on either side of the Tuileries Palace and aligned with the Avenue des Champs-Élysées and Avenue de la Grande-Armée (the 'Axe Histotrique' of Paris). The Arc du Carrousel was completed in 1808. Following Napoleon’s exile and defeat at Waterloo, the deposed monarchy was reinstated. Bosio's Quadriga, “Restoration of the Bourbons,” was placed on top of Napoleon’s Arch. In 1836 the second arch, The Arc de Triomphe, and the Luxor Obelisk were dedicated. The 1871 Paris Commune‘s burning of the Tuileries Palace provided the unobstructed view of the historic alignment of the two arches and obelisk. In 1989 IM Pei placed an equestrian statue of Louis XIV adjacent to his Louvre Pyramid, on the Axe. It is the best vantage point. Nor was the Plaza’s axis Brooklyn’s first alignment with the future Tower. In 1836, the cornerstone of Brooklyn’s City Hall was laid on land sold by the Pierrepont and Remsen families. In 1838, Henry Pierrepont established Green-Wood Cemetery. A straight line from the tip of the Empire State Building to the dome of Borough Hall, bisects it at a 90-degree angle and extends to Green-Wood, to the Pierrepont family plot. Thirty years before Olmsted and Vaux designed the Plaza. This view is the Crown Jewel of the Prospect Park masterpiece. To protect this view, share it with your neighbors. Sign Petition - "Save the View"
in Brooklyn's Grand Army Plaza. bisects the Arch at a 90-degree angle. First, some words from Olmsted and Vaux. “It is a common error to regard a park as something to be produced complete in itself, as a picture to be painted on a canvas. It should rather be planned as one to be done in fresco, with constant consideration of exterior objects, some of them quite at a distance and even existing as yet only in the imagination of the painter.” – Olmsted, Feb. 1870. “We are both supposed to be dead and buried two years ago [they had resigned from Central Park in 1863]…They [the CPCommissioners] have been living on what they found in the houses of the murdered men but the day for that ceases and the cloven foot appears. Now comes our opportunity.…The Brooklyn Park is all our own. 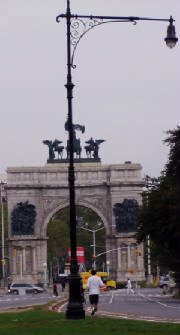 Viewed from the median of the principal entrance into Prospect Park, the Brooklyn Mirador (1970), Soldiers' and Sailors' Memorial Arch (1892). Bailey Fountain (1932) are precisely aligned with the Tower (1931). The tip of the Tower, the middle of the Arch and the Mirador form a three-point-alignment which bisects the Arch at a 90-degree angle. Twenty years before the Arch three other structures had already defined this line. The Plaza was the first element of Prospect Park completed and opened to the public. The axis of this elliptical plaza was the essential starting point, the frame on which all future alignments would be based. Since 1865, this 'line of vision' has evolved through the original design of Prospect Park Plaza, the development of the site of The Empire State Building and the precise placement of the Mirador (the sole vantage point of the alignment). Frederick Law Olmsted toured the South and Texas in the early 1850s, reporting for the New York Times on life in the 'Cotton Kingdom'. He supervised the building of Central Park until war broke out, then, as executive secretary of the Sanitary Commission, managed the care of wounded Union soldiers for President Abraham Lincoln. He co-founded the Union League and Nation magazine before he designed Prospect Park. In 1865, as the Civil War ended, the Brooklyn Park's elliptical entrance plaza was planned so its axis would point at the Fifth Avenue mansions of the sons of William Backhouse Astor Sr., a leader of a group of influential Democratic politicians and merchants. This group, weeks after the election of Lincoln in November 1860, in order to prevent war or secession, held the 'Pine Street Meeting'. They appointed a committee headed by former President Fillmore that was to assure the South and Jefferson Davis of their support to amend the Constitution to provide permanent protection for slavery. Their activities may have contributed to the atmosphere which led to the Draft Riots of July 1863 and continuing strong northern anti-Lincoln sentiment. The Plaza opened in 1867 with a simple fountain, a lone jet of water, planned as its centerpiece. Named "The Fountain of the Golden Spray", this was a subtle message aimed at the enemies of the assassinated President. 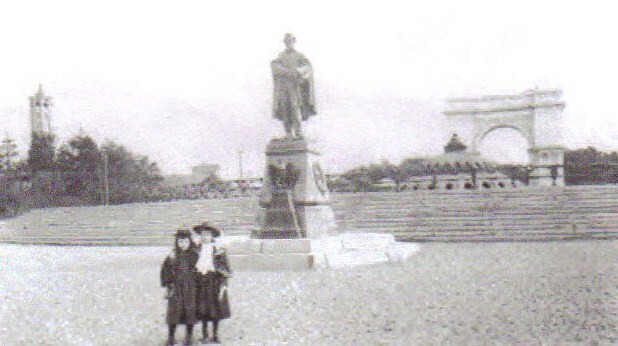 In 1869, the first statue dedicated to Abraham Lincoln was positioned at the northern end of the plaza's axis. He holds the Emancipation Proclamation and points to the words 'shall be forever free.' Facing north, he confronts his enemies. Four months later Olmsted, speaking at the Lowell Institute indicated that this positioning was intentional: “It is a common error to regard a park as something to be produced complete in itself, as a picture to be painted on a canvas. It should rather be planned as one to be done in fresco, with constant consideration of exterior objects, some of them quite at a distance and even existing as yet only in the imagination of the painter.” – Olmsted, Feb. 1870. In 1889, when the cornerstone of Duncan's Defenders Arch was laid, Lincoln's words and the invisible corridor were to have been framed in stone. A simple arch, a simple message. But political tides had already turned. Rutherford Hayes was awarded the Presidency by a joint session of Congress in 1877 based on his campaign committee's promise to remove Union troops from the South, ending Reconstruction. Brooklyn Park's commissioners were replaced in 1882. In 1883, the Supreme Court reversed the Civil Rights Act of 1875. In 1892 the Soldiers' and Sailors' Memorial Arch was completed. Following Brooklyn's Columbus Day festivities celebrating the 400th anniversary of the discovery of the New World, Grover Cleveland, between his terms as President, dedicated the Arch. (2)...The Lincoln Statue was turned around, marched into Prospect Park, and abandoned. (3)...Vaux drowned in Gravesend Bay in November. By 1897, the Fifth Avenue Astor mansions had become the original Waldorf-Astoria Hotel. In 1898, The Arch was draped in statuary. Brooklyn became part of New York City. In 1931, The Empire State Building replaced the Waldorf-Astoria, revealing the visual corridor. The follwing year, Bailey Fountain was unveiled. Wisdom and Feclicity, the figures atop the the fountain (who are split by the alignment) appear to be parents leading their child from Prospect Park. Stopping at in the roadway leading into the park (where the median and Mirador will later be built) they look through the Arch and see the Tower of the Empire State Building framed within and precisely bisecting the Arch. In 1954, racial segregation was ruled UNCONSTITUTIONAL. President Eisnehower signed the Civil Rights Act of 1956. President Lyndon Johnson enacted the landmark Civil Rights Act of 1964. In 1965, two years after his assassination, the Brooklyn Memorial to John F. Kennedy was dedicated at the north end of the Plaza's axis, facing north, at or near the spot where the Lincoln Statue stood. In 1970, two years after the assassinations of Reverend Martin Luther King Jr and Senator Robert Kennedy, the original Brooklyn Mirador was completed. It stands directly on the southern extension of the Plaza's axis, inside Prospect Park. This provided a vantage point that, eventually, some observant and obsessive person with nothing particularly better to do, would trip over, wonder at and focus on. Labor Day afternoon, 2010, while standing at the Plaza, I completed handing out Mirador-rated booklets and documentation to Carribean Day Parade spectators, I headed to my studio in Gowanus. In the gutter, on top of some debris from some street dig in front of the studio I found a crudified 1867 nickel. 1867 is the year the Plaza was dedicated. The view from the Prospect Park Mirador should be recognized as a National Art Treasure - promoted and protected. The view goes through the landmark arch, the landmark plaza, and to the landmark tower. This is a window view on our democratic rights struggle as a continuing work-in-progress. Work on the Mirador itself, placed on the southern extension of the plaza's axis, was begun in the year following the assassinations of Martin Luther King and Robert Kennedy. Currently, Building Six of Atlantic Yards threatens to eclipse the view. April 2011 - The Lincoln statue is returning to the Plaza. facing north, along the Plaza's axis, overlooking the fountain. across lanes of traffic, looking at "his" Plaza . you would see Lincoln silhouetted before Defenders Arch. and become a locals' destination for after dinner family strolls. Perhaps a resumption of Decoration Day ceremonies. From the JFK Memorial, Lincoln appears through the fountain mist..
you see Lincoln confronting the Empire State Building. This respects and conforms to the 1865 motives of Vaux, Olmsted and Stranahan. Their plan was that Lincoln would face north in Brooklyn's Civil War Memorial Plaza. John Howard Payne's "Home Sweet Home" (twice). The alignment began with the placement of the Plaza. before the end of the Civil War. 25 years before the Arch. 65 years before the Empire State Building. More than 140 years ago. North is to your right. By 1865 Grand Army Plaza’s shape and location had been determined. 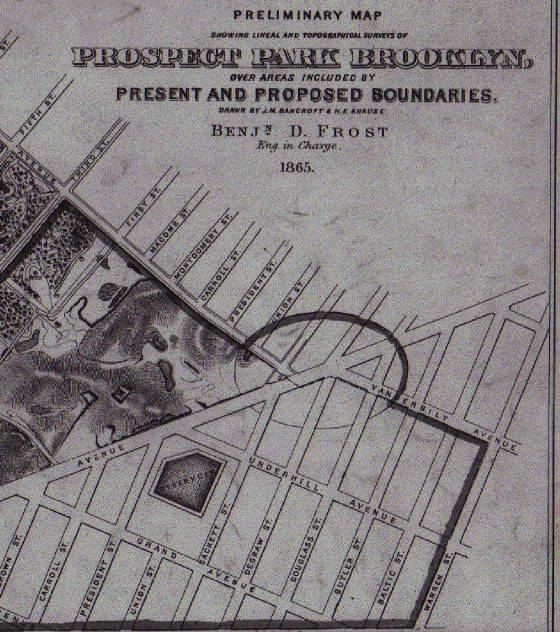 Even before the actual boundaries of Prospect Park were finalized. the size, shape and location of the planned Plaza was not affected. framing the message of the Emancipation Proclamation. the Astor brothers’ Fifth Avenue mansions. sail through the Arch along the axis and see the Tower as they leave the park. The photo at the top of this site is the 'line of vision' as we see it today, with the Empire State Building above the Fountain, framed by the Arch. Below, this same 'line-of-vision' was clearly visible between 1892 and 1895. Lincoln, Vaux Fountain. Park south of Arch. unadorned Arch, the Vaux Fountain and the Lincoln statue. was to be a simple fountain, a single stream of water. Brooklyn Eagle reported on the Plaza's progress. and the grounds of the Astors' Fifth Avenue mansions. was unveiled October 21, 1869 at the northern boundary of the Plaza. and the Fifth Avenue mansions. In 1873 the original fountain was replaced by the above pictured Vaux Fountain. Olmsted and Vaux completed major involvement in the park and dissolved their partnership. and the entire park commission were replaced. to redesign the Plaza in the neo-classical tradition. Duncan's Arch was started in 1889 and dedicated October 21, 1892.
below the inscription "To the Defenders of the Union 1861-1865". Lincoln statue, to the Fifth Avenue mansions. (facing today's Wollman Rink from the Concert Grove). November 19, Vaux was found drowned inGravesend Bay. Olmsted retired due to senility during this year. In 1897, the Vaux Plaza Fountain replaced by Darlington's 'Electric Fountain. Olmsted was consulted and blessed the fountain's placement. and with his Army (1900) and Navy (1901) groupings on the sides. replaced the Astor mansions on Fifth Avenue between 33rd and 34th Streets. the fourth fountain, today's Bailey Fountain, was unveiled in 1932. 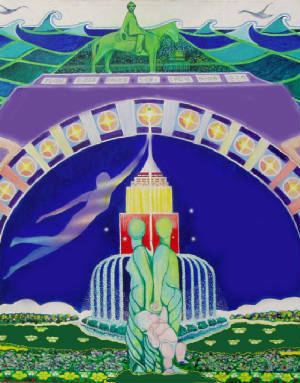 The two figures atop the fountain, Wisdom and Felicity, are split by the Tower. was dedicated at the north end of the Plaza’s axis, where the Lincoln Statue stood. of the Plaza’s axis. This view is intended to remind us of something. the continuing work-in-progress that is our democracy. I discovered 'The Brooklyn Mirador'. and look though the center of the Arch. bisects and seems to balance the Arch. (And a badly placed street light). the Empire State Building under construction through the Arch. But the glare of that single street light blocks the night view. 1. Recognize the view from the Mirador as a National Art Treasure. It should be promoted and protected. 2. Enable this historic ‘long view’ at night. Remove the glare. 3. Return the Lincoln Statue to Grand Army Plaza. Dedicated October 21, 1869 - Holding the Emancipation Proclamation - "Shall Be Forever Free"
Why, in 1865, did the axis of Grand Army Plaza point to 350 Fifth Avenue? Why did the Memorial Arch come to frame the world's tallest building? Olmsted and Astor were among leaders of opposing political groups throughout the Civil War Era. The Civil War ended and the elements on the 'line of vision' conveyed a simple message to the defeated. But amid changing political tides, the plaza's future shifted to others who revised the message. Do you believe that Vaux, Stranahan and Olmsted could have been unaware of this alignment? Lincoln was elected in November 1860. On Dec 15, William Backhouse Astor Sr (1792-1875), son of the John Jacob Astor (1763-1848), to save the Union, protect their investments and prevent secession or war, held the 'Pine Street Meeting' in New York City with the most influential Democratic politicians and merchants. They passed resolutions urging added protection for slavery and appointed a committee headed by former President Fillmore (who had signed the Fugitive Slave Law in 1850) to assure the South and Jefferson Davis of their support to amend the Constitution to provide permanent protection for slavery. As construction of the Arch in Grand Army Plaza began 1889, the son of John Jacob Astor III, William Waldorf Astor (1848-1919) razed the family's mansion on Fifth Avenue and 33rd Street and built the 13-story Waldorf Hotel which opened in 1893. He moved to England to become the 1st Viscount Astor and is buried in Buckinghamshire. After his mother Caroline moved uptown, the mansion at 350 Fifth Avenue, was converted to the 17-story Astoria Hotel in 1897 by John Jacob Astor IV (1864-1912) who died on the Titanic. He was the only son of William Backhouse Astor Jr. In 1850 Olmsted traveled to Europe to visit public gardens. He published Walks and Talks of an American Farmer in England in 1852. In 1851, The New York Times was established as the New York Daily Times. The paper commissioned the 30-year old Olmsted to travel through the American South and Texas beginning in 1852. His dispatches were also published in book form as 'A Journey in the Seaboard Slave States' (1856), 'A Journey Through Texas' (1857) and 'A Journey in the Back Country' (1860). These were reprinted and revised as 'Journeys and Explorations in the Cotton Kingdom of America' in 1861, during the first six months of the Civil War, helping inform and strengthen antislavery sentiment in New England and Union support in Europe..
From 1857 to mid-1863, Vaux and Olmsted were the architects of Central Park. Dec 20, 1860 - South Carolina secedes from the Union. April 13, 1861 - Fort Sumter surrendered. From 1861 to 63, he worked for Lincoln as Executive Secretary of the United States Sanitary Commission, for the relief of suffering among the Union soldiers. In July 1862, Olmsted influenced military policy, urging enactment of a military conscription act. He proposed the policies of substitution and commutation. On September 22, Lincoln announced the Emancipation Proclamation. Olmsted suggested the draft version be publicized in the South by having the passing Union armies post and distribute printed linen handbills. These would be passed on hand-to-hand, by the curious and motivated to those in distant corners and plantations. Jan 1, 1863 - The Emancipation Proclamation was issued. Olmsted co-founded the Union League in Feb 1863. (More on the Union League follows). July 1-3 - Lee defeated at Gettysburg. July 4 - Grant's successful Siege of Vicksburg is concluded. July 13-16 - The NYC Draft Riots. The rioters targeted the offices of the Times on Park Row, and the Union League, overlooking Union Square, but were repulsed by well-armed defenders. Olmsted lobbied for martial law and for the hanging of the city's Copperhead political leaders who he held responsible for the rioting. Sept 14 - Olmsted leaves NYC and arrives Oct 14 in Bear Valley, Calif. Oct 1863 through Sept 1865, he managed the Mariposa Company's gold mines near Yosemite Valley. Nov 8, 1864, Lincoln is re-elected, defeating Democrat candidate Gen. McClellan, who had been relieved of his command. March 4 1965 - Lincoln inaugurated. April 9, Lee surrenders. April 14, Lincoln assassinated. May 26, Last rebel troops surrender. Dec 6, Ratification of the 13th Amendment, abolishing slavery. In June 1865, Olmsted co-founded the Nation magazine to cultivate Americans. In December, he returned to New York to work with Vaux on Prospect Park. With the disputed electoral election of Hayes in 1877 and his promised removal of Union troops from the South, Reconstruction was effectively stalled until the 24th Amendment, barring the poll tax in federal elections, was ratified under Lyndon Johnson, four score and seven years later. In 1883, Supreme court reversed 1875 Civil Rights Act. In 1895, Olmsted retired, the Lincoln Statue was abandoned in the Concert Grove and Vaux was drowned off Gravesend Bay, Brooklyn. May 18, 1896 - Landmark Supreme Court decision Plessy v. Ferguson holds that racial segregation is Constitutional, paving the way for the repressive Jim Crow laws in the South. The club dates its founding from Feb. 6, 1863, during the Civil War. Tensions were running high in New York City at the time, as much of the city's governing class, as well as its large Irish immigrant population, bitterly opposed the war and were eager to reach some kind of accommodation with the Confederate States of America. Thus, pro-Union men chose to form their own club, with the twin goals of cultivating "a profound national devotion" and to "strengthen a love and respect for the Union." The Union League (also known as Loyal Leagues) was actually a political movement before it became a social organization. Its members raised money both to support the United States Sanitary Commission, the forerunner of the American Red Cross, which cared for the Union wounded following battles, and the Union cause generally. Why was the axis of Grand Army Plaza pointed at the Fifth Avenue mansions? After the military victory preserved the Union and abolished slavery, a simple message was sent to the leaders of the losing faction in New York City. The plaza opened with the future site of the Fountain of the Golden Spray, a simple single jet of water at its center. The plaza's axis was aimed at Astor's circle. And two years later, the Lincoln statue confronted them with the Emancipation Proclamation. Duncan's simple, unadorned Arch, was to frame this message in stone. Political tides turned. Lincoln was banished. The message lost. But the 'line of vision' retells the story. American history. And the view is great..
Why did Olmsted, a Civil War activist, leave NYC two months after the Draft Riots to manage a gold mine? For financial gain, exile or a safe haven? He was involved in the matters of the Western Sanitary Commission and helped Lincoln carry California in the 1864 election. He was active in promoting large landscaping projects on the West Coast - municipal parks, colleges and cemeteries. And active in the preservation of the natural beauties of Yosemite Valley for the benefit of all. What role did Olmsted play in planning the plaza before he returned to NY in December 1865? Was the positioning of the axis Stranahan and Vaux showing Olmsted he would have a free hand. In the 1866 Report to the Brooklyn Park Commission, a Vaux draft dated Feb 4, 1865 shows the oval plaza as the principal entrance to the park. Or had Olmsted and Vaux been aware of the potential for such an alignment even before the Civil War, when there were several Brooklyn sites contending for a major park to compete with Central Park? Was there eye-contact between the original Waldorf Astoria and the top of the Arch? Or was the hotel visible thru the Arch from the park roadway above the Long Meadow? I have found no photos showing the Empire State Building under construction as viewed thru the Arch. Did the simultaneous construction of Bailey Fountain in the Plaza obstruct the view? What else is on the axis? It extends south beyond the park. In the Concert Grove, does the line from the eight-pointed star skylight of the Oriental Pavilion to the Lincoln statue extend to the pier in Gravesend Bay where Vaux body was found in Nov 1895, months after Lincon was moved? What is planned that may block the view? Building 6 of the proposed Atlantic Yards. I am looking for photos of the Plaza's original fountain 1867-1872 and the Payne Monument. Many sources indicate that in 1803, John Jacob Astor bought a house at 233 Broadway from NY Senator Rufus King, when William was 10. After the death of his wife in 1834, John Jacob razed the entire block and built the fabulous Astor House hotel. President-elect Lincoln spoke there in 1861. In 1913, the Woolworth Building, at 233 Broadway, became the tallest building in the world (until 1930). Like father, like son? The homes of William's sons, John Jacob Astor III and William Jr., at 338 and 350 Fifth Avenue became the original Waldorf Astoria by 1897, before becoming the Empire State Building in 1931, the new 'tallest building in the world'. Except that the Rufus King house was actually 223 Broadway. The acknowledged hoax was that Captain Kidd buried treasure on land that was deeded by Indians to Olmsted’s ancestors in 1699. Stolen from the Olmsted family’s Deer Isle, Maine property in 1800 by a trapper working for John Jacob Astor, this was the original source of the Astor fortune. After the Arch was built in 1892 Olmsted, walking on his property, learned of the treasure, its theft and brought suit against the Astor family for millions. “A Notable Lawsuit” – Franklin H. Head- 1898. Page 155 is a photograph of the Plaza with the Lincoln statue, before the Arch. - Page 76 of 'Fifth Avenue - A Very Social History' by Kate Simon. "On the southwest corner of Thirty-fourth Street and Fifth Avenue, part of the land that son Wiliam Backhouse had bought in 1827, William built a red brick house which he didn't use - the family stayed in the colonnaded row of Layfeyette Place - but later willed to his son, the second William Backhouse. William's brother, John Jacob Astor III, placed his house on the northwest corner of Thirty-third Street and that one was inherited by his son, William Waldorf Astor. The short block became a busy arena of social competition between branches of the family; the fiercest and most durable competitor, Mrs. William B. (nee Caroline Schermerhorn), clawed her way to the apex of society as the Mrs. Astor. But that came later, and later still the conversion of the two Astor houses, 338 and 350 Fifth Avenue joined (some said carefully separated) by a garden, to become the first Waldorf-Astoria Hotel in 1890." October 21, 1869, the Lincoln statue is presented at the north end of the Plaza. The New York Times reported the statue was facing West. Days earlier, Olmsted had written sculptor Brown: “I am instructed to inform you that the Park Commission can not allow the Statue of Lincoln to stand in its present position with its face to the west.The objections to it are of such a character that I am quite sure that when they havebeen explained to you, you will at once acknowledge the necessity for a change.” Brown, wanting Lincoln’s face to be presented in the best light possible, wrote he could “see by your design of the plaza that it would be more in unison with the main idea to have it face to the north, but to do so would sacrifi ce the Statue to its position.” These quotes are from "Henry Kirke Brown and the Developement of American Public Sculpture in New York City, 1846-1876," the Dissertation of Karen Yvonne Lemmey (2005), page 266. Does the Line extend South, into the Park? In 1871 the bust of Washington Irving (1783-1859) was installed in the park facing the Concert Grove. He was a pallbearer and executor of John Jacob Astor's will in 1848, and biographer of Astor's Oregon fur trading business. In 1857, his endorsement made Olmsted superintendant of Central Park. In 1873 a bust of actor John Howard Payne (1791-1851) was placed on Sullivan Hill by the Faust Club. It should be across the Long Meadow from the Picnic House today. I believe that this bust would be at the Southern end of the line - the mansion, Lincoln statue, fountain, and this bust. This Spring, when I went to Sullivan Hill to find Payne, all that was there was a wooden cross, "Tyler, beloved feline, June 2000 - April 2008". The bust is on loan to the 'Home Sweet Home' Museum in East Hampton, NY following an attempted 1973 vandalization. In 1823, Washington Irving and John Howard Payne shared an apartment in Paris after Payne was released from debtors prison in London. Payne wrote the lyrics "There's no Place Like Home" for the operetta 'Clari - Maid of Milan' which opened in London in 1823. In the 1830s, Payne was jailed by the Georgia militia for passionately defending the rights of the Cherokee, against removal from their Native American lands. His multi-volume works documented the Cherokee's society and history. He believed the Cherokees to be one of the Ten Lost Tribes of Isreal. In 1842, President Tyler appointed Irving Ambassador to Spain and Payne consul to Tunis. Polk's administration recalled them. President Fillmore reposted Payne to Tunis 1850, where he died. In 1862 soprano Adelina Patti sang Payne's 'Home Sweet Home' at the White House as the Lincolns mourned the death of their 11 year old son Willie. A tearful Lincoln requested an encore. The song was a Civil War standard. Patti played the role of Margueritte in Faust in 1875. Link to hear "Home, Sweet Home"
General John Charles Fremont, commander of the Western Division, imposed martial law in Missouri, August 20, 1861, confiscating suspected secessionists' private property and emancipating their slaves. Fremont refused Lincoln's request to rescind the unauthorized and premature order and was relieved of command on November 2. In March 1862, he was placed in command of the Mountain Department of Virginia, Kentucky and Tennessee. Fremont, the 'Great Pathfinder', had been the Republican's first Presidential candidate, in 1856, running on an anti-slavery platform. He and American (Know Nothing) Party candidate Fillmore lost to Federalist Buchanan. Lincoln had made 50 speeches supporting Fremont. The Mariposa Estate, near Yosemite, was purchased by Fremont in 1847. He sold it to the Mariposa Company in June 1863. This was the gold mining interest that Olmsted managed. The 1808 Arc du Carrousel, begun in 1806, was built to celebrate Napoleon’s victories. Napoleon placed the 'Horses of Saint Mark' (which he had removed from the basilica in Venice in 1797) atop his Arch. Following his defeat at Waterloo, the allies re-instated the Monarchy which was deposed by the 1789 French Revolution. The 'Horses of St.Mark' were returned to Venice and, in 1828, the Arc du Carrousel was crowned by Bosio’s Quadriga, “The Restoration of the Bourbons.” The Quadriga refuted the French Revolution and the achievements commemorated by the arch on which it stands. Precisely aligned with the Arc du Carrousel along the Axe Historique, you see the Luxor Obelisk and the Arc de Triomphe. The obelisk was a gift from Egyptian viceroy Mehemet Ali to King Charles X in 1833. Charles abdicated and the Obelisk was unveiled by King Louis Philippe in 1836, the same year that the Arc de Triomphe (also begun in 1806 by Napoleon) was finally completed. The view of this alignment was not possible until 1871, when the Paris Commune burned down the Tuillieres Palace. From the proper elevation, I believe that the tip of the Luxor Obelisk will appear to touch both the keystone of the Arc du Carrousel and the keystone of the Arc de Triomphe (and perhaps the arch at La Defense). The Louvre's Glass Pyramid in the Cour Napoleon does not lie along the Axe Historique. But the Pyramid's architect, I. M. Pei, requested a statue of Louis XIV, as 'Alexander the Great,' be placed adjacent to the Pyramid and in the direct path of the Historical axis. I wonder if this achieves the proper perspective. From a single vantage point, the tip of the tower of the Empire State Building bisects the Civil War Memorial Arch in Brooklyn’s Grand Army Plaza at a 90-degree angle. The tower appears to touch the arch’s keystone. On Decoration Day, Union Army veterans marched from the Henry Ward Beecher statue at city hall to Prospect Park Plaza. Orator Rev. Henry A. Powell confronted the enemies of the Grand Army. Days later, the Lincoln statue was removed from the Plaza, a year before the Supreme Court ruled racial segregation Constitutional, ‘separate but equal.’ Moved into Prospect Park and aligned with the Concert Grove Pavilion, the statue now faced Gravesend Bay where, on November 19, 1895, the embattled 70-year old, 4’10” Calvert Vaux was found drowned. In 1898, the Civil War Arch was crowned with MacMonnies’ (an American ex-patriot working in his Paris studio) Quadriga facing South. The alignment was now visible, but only from the middle of the busy roadway leading into Prospect Park. In 1965, two years after his assassination, a memorial to President John F Kennedy was unveiled in Grand Army Plaza, facing North, on the spot where the Lincoln statue was removed 70 years earlier. In 1969, the year after his brother Senator Robert Kennedy and Reverend Martin Luther King Jr. were assassinated, a median on the Prospect Park entrance roadway and a lamppost were planned, providing a safe vantage to view the alignment. 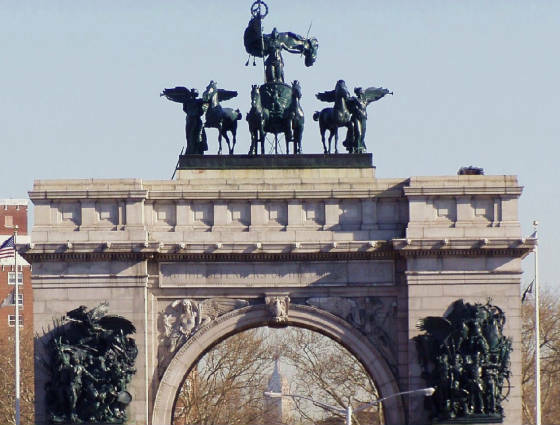 The Quadriga atop the Civil War Arch in Brooklyn's Grand Army Plaza, was installed two years after the first statue dedicated to Abraham Lincoln was removed from the plaza and the United States Supreme Court ruled it Constitutional for states to require racial segregation. The Quadriga refuted the Civil War and the achievements commemorated by the arch on which it stands. 'Jim Crow' would officially replace emancipation as the law of the land for the next 60 years. The cornerstone and foundation of Brooklyn’s city hall were laid in 1836 (the same year the Arc de Triomphe and Obelisk were dedicated in Paris and thirty years before Vaux designed the Plaza) on land donated by the Pierrepont and Remsen families. During the Panic of 1837, Henry Pierrepont bought Dutch farmers’ land and in 1838 established Green-Wood Cemetery. A line drawn from the Empire State Building to the dome of Boro Hall extends to Green-Wood’s Section 68 (the family plot of Hezekiah Beers and Anna Maria Constable Pierrepont, Henry’s parents) and on to the Crescent Water. Anna’s family was New York State’s largest landowner. She and Hezekiah received 500,000 acres as a wedding present from her father who, in 1797, had commissioned the best known Gilbert Stuart portrait of George Washington. Hezekiah’s grandfather was of a founder of Yale University. A few words about myself. An artist, I have earned my living since age 18 as a computer programmer, systems analyst and security administrator until 2003. I connect dots and recognize patterns and know the 'aha' moment. I had noticed the Empire State Building through the Arch many years ago. But in January 2008 I realized that the Tower, Arch and Mirador completed a precise three-point-alignment which definitely bisected the Arch at a 90 degree angle. I could not accaept that this was coincidence, regarless of what local historians and park officials thought. Bailey Fountain, also bisected, was built at the same time as the Tower. And even the concrete base in Prospect Park, where I came to this realization had a relevant association to the alignment. Finding no documentation, written or pictorial, of this alignment I spent 2008 putting pieces together while making art at the Brooklyn Artists Gym near Gowanus Canal. As new facts or my errors came to my attention, I revised my related web sites and books already in print. I consider everything to be works-in-progress. I think there is important history here, and hope the results of my efforts come to the attention of accredited and recognized authorities who may find a deeper meaning in the works of Vaux and Olmsted. Whatever happens, the view is great and it should be preserved for our children. Richard F Kessler. Another link to my artwork.